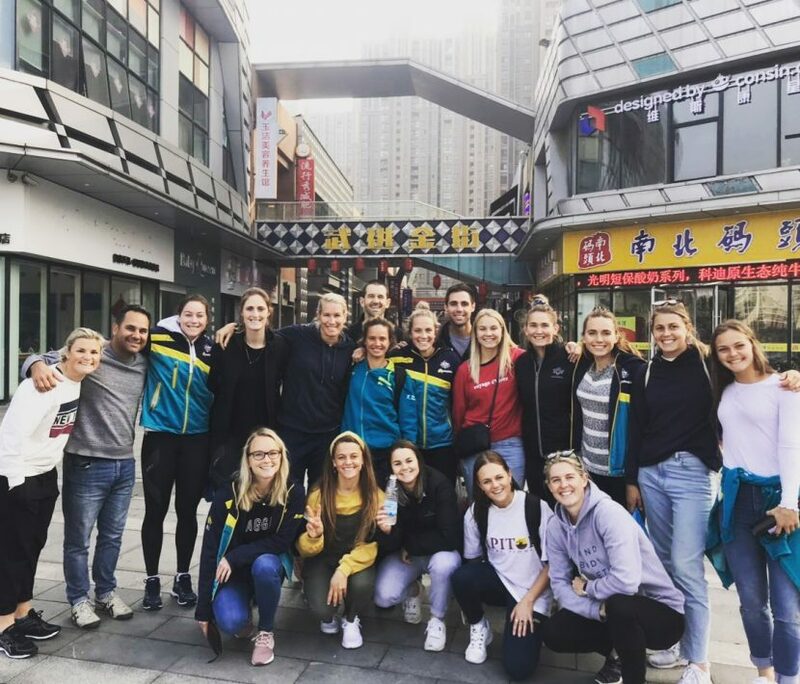 For the Hockeyroos final tour of the year we packed our bags and jetted over to Changzhou, China. Following our 4th place finish at the World Cup we were invited along to the Champions Trophy tournament as a late addition. A very exciting opportunity for us as it meant playing 5 other top nations at a tournament where world ranking points were up for grabs. Before leaving for China we were made aware of the food and hygiene issues associated with travel in the rural part of the country. All water would need to be bottled only and anything that has been washed using tap water was not to be eaten. 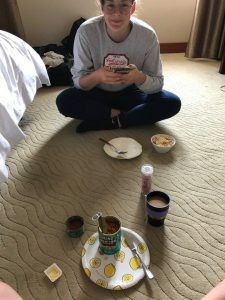 This meant a limited array of options and therefore each athlete decided to pack as many ‘normal’ foods as possible and all snacks, cereals and breakfast items were to come from Australia. My packing list included: UHT Milk, Butter & Peanut butter, muesli, raw balls, and dry biscuits. A small list compared to some others but I knew I could always fuel adequately for training or a game using any of those items. Arriving in Changzhou we were all feeling a little rough given the 20 hours it took to get here. Despite being directly above Perth and even in the same time zone we still had to fly 5 hours to Singapore, stopover for 2 hours, 5 hours to Shanghai, 1,5 hours to get out of the airport then a 4 hour bus ride to Changzhou. 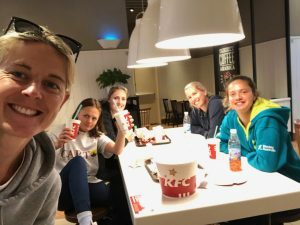 As athletes we become pretty resilient in these situations and just sleep when we can but the most exciting part of the trip is our first buffet meal when we arrive in a new city. China was very different haha! Thankfully all our Aussie food made it through customs so we knew we had a good back up plan. The first few days were spent training and getting used to the pitch. Jet lag wasn’t an issue like usual so we arrived much later than we would had we travelled to Europe or South America. Day two we played a practice match against the hosts China that we won 2-0. Our hotel is quite nice with big rooms and large beds but smoking is permitted inside which means everywhere stinks. It has been a great reminder of how lucky we are that smoking is no longer socially acceptable in Australia. 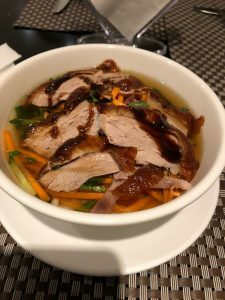 Eating dinner in the hotel restaurant with men blowing cigarette smoke your way is enough to put anyone off their meal. Champions Trophy tournaments are always short and sharp with 6 games played across 9 days. If you manage fatigue well it can be a good thing as there is no time for much else so you just focus purely on the games. We have trained every rest day in order to keep momentum but also to practice our penalty corners and one v ones throughout. Also given the conditions here we are all very happy to have minimal free time as there is not a lot to do. Today is game 5 for us and a crunch game. We are playing Japan and must win in order to guarantee a spot in the final against Holland. A strong start to the tournament meant we put ourselves in a great position to do this yesterday against China but with a 0-0 draw we are left to battle it our with our other close neighbours and Asian Cup Champions Japan. Ash Wells and I have been playing halves throughout the tournament which has worked quite well. Our similarities in style mean the change is not too disruptive for the girls plus its great to be able to play against every opposition here. Throughout the year I have been fortunate enough to play full games at Comm Games and World Cup but as the year comes to an end it is nice to just be playing along side my good friend and team mate of many years. Playing against the top nations in the world has been a fantastic way to finish off our year. 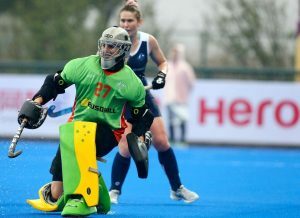 This is the last Champions Trophy tournament ever and potentially the last full tournament before the Tokyo Olympics. World ranking points are up for grabs so fingers crossed we can finish on top and move ourselves up to second in the world. 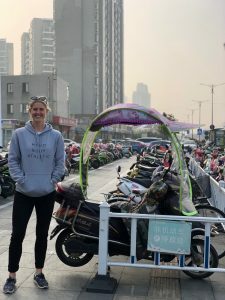 The only outing for the trip – a local shopping centre where everything was in Chinese. We are not allowed to eat red meat over here due to the risk of doping from the hormones they inject into it so chicken was our only option. No english menus anywhere except FKC….that will have to do! 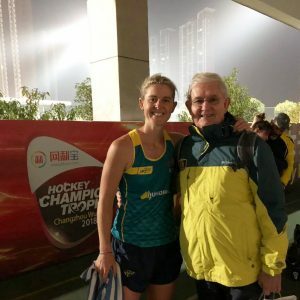 One bonus of playing in China is that my dad lives here and has been able to come and watch. Changzhou is not the most tourist friendly place but all our families have found a way to keep themselves amused between games.